Best Two-Person Hot Tub. Spa Luxury For Two! After doing a deep dive into the two-person hot tub market, we’ve found that the best two-person hot tub is the Essential Hot Tubs Devotion Spa. It’s a luxurious option that features 24 jets, plenty of special features, and enough room to comfortably seat two people of most size categories. It reaches a higher, but still safe, temperature than most other options in its price range and has clear instructions for installation. Although it is on the costly side, its feature set warrants its price point, and the SS244247403 Devotion beats out the competition. For more information on the Essential Two-Person Hot Tub, see the Product Reviews section below. 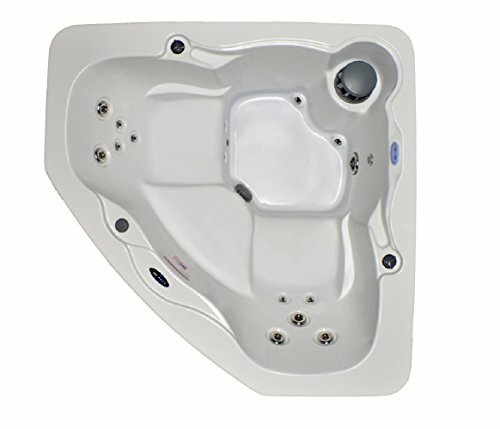 Our the runner up hot tub is the Hudson Bay 14 Jet Spa with Stainless Jets. Part of the reason why the Hudson Bay comes in second place is that it has half of the jets of the Essential Hot Tubs SS244247403, while also not having quite as much comfort for occupants. However, that does not mean it’s not luxurious. In fact, for people who would like to spend $1,000 less, it’s a great option for people who want something durable without investing in the winner of this review. And you can even squeeze in a third person if you want to try. 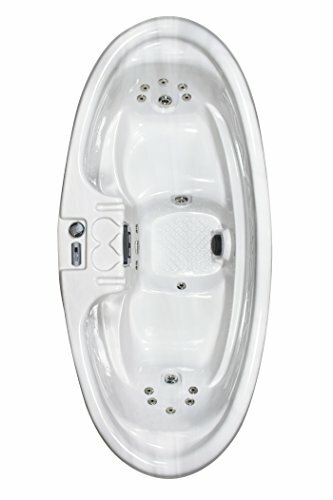 Hudson Bay 3 Person 14 Jet Spa with Stainless Jets and 110V GFCI Cord Included. For further information on the Hudson Bay 14-Jet Spa, see the Product Reviews area below. Many people want a hot tub, but not everyone has hot tub funds. When this situation arises, it’s important to have a budget option. For people with a limited bank account, the best pick is the SaluSpa Siena AirJet Inflatable Hot Tub. The SaluSpa is an inflatable hot tub that features many of the incredible accouterments that people know and love about sturdier models. While it doesn’t quite have the style of the built-in tubs, the SaluSpa Siena is great for people that would like hot tub comfort for a third of the price of other models. To learn the details on the SaluSpa Siena, see the Product Reviews section below. When buying a hot tub, there are some considerations to keep in mind. How many people need to fit? How many jets? What kind of material should it be made of? Do you want a custom-built system or an off-the-shelf design? A two-person hot tub is great for small spaces, and for those who are looking for quiet relaxation and intimacy, rather than a larger hot tub for hot tub parties and more elaborate circumstances. Most of us just want to be in the hot tub alone or with a single loved one, and a two-person tub is ideal for these situations. Two-person hot tubs come in a variety of shapes and configurations, from oval to rectangular to triangular. Some of the tubs on our list are advertised as three-person tubs, but the size and scale of these tubs are more appropriate for two people at a time, rather than three. We’ve all seen the clips of a ton of clowns exiting a single car, but that’s not what we’re aiming for here! Comfort and relaxation are the targets with these two-person tubs. Most of the tubs on our list today are of the Plug and Play Hot Tub variety, meaning they plug into a standard 110v grounded outlet. However, some are not, and will require a professional electrician to wire the tub up. Be sure to keep the additional cost of having the electrician come out as part of your overall pricing! Most of these tubs will require their own 15amp circuit while running (i.e. you don’t want to be running your hot tub at the same time you’re running an outdoor misting fan or something similar on the same plug). Most hot tubs are made of acrylic or fiberglass, though one on our list is an inflatable hot tub. Inflatable tubs work well enough, but they look a little quirkier than a traditional molded plastic or fiberglass tub, and of course, they’re much easier to puncture. They’re also much cheaper! In general, the higher the number of jets, the better the build-out of the tub. A greater number of jets means more water will be moved around, more bubbles, and more fun! Some tubs feature waterfall jets, which are jets that spit water out in a waterfall pattern, from above the hull of the tub, down into the tub. These are extra nice in that they provide visual interest, a pleasing sound, and are often paired with lighting for extra dramatic effect. Some inflatable tubs count their bubble jets as jets, but really these bubble jets are supplemental, and while they do provide bubbles and motion, aren’t the same as the powerful massaging jets. One of the big aspects of a hot tub is how well it holds temperature, and what temperature it will achieve. The vast majority of hot tubs on the market now are limited to 104′ for safety (though some will occasionally go a tiny bit above that to 105′ or so). Some will advertise 104′, but will only be able to get up t0 100′ or so. Most of the tubs on our list are not very well insulated. If you’re looking to use the tub outside in cold weather, you may want to consider adding insulation as you need to in order to use it more frugally in the winter. The smaller the tub, and the less water in the tub, the quicker it will come up to temperature. This is one of the major virtues of a small tw0-person hot tub. Be sure that the location you’re setting up the hot tub is appropriate for the tub. Concrete slabs are ideal, so garages, basements, patios, and similar outdoor spaces are great choices. Decks, not so much. Be sure to check with a structural engineer before installing a hot tub on a deck, as a hot tub full of water and people can easily go way over the required structural loads for a typical wood deck. Maintenance and water quality balancing are a must with any pool or spa. Once you get the water balanced, you should be able to keep it in reasonable balance without too much effort, assuming you regularly cover your hot tub with a hot tub cover. If you let rainwater, algae, and other substances in there, you’ll need to get to work using the appropriate testers and hot tub chemicals. Be sure to consult our guide to common hot tub problems should you run into issues with your tub. Consider whether you want or need accessories with your tub, such as hot tub stairs to allow you to more easily and safely enter your tub, or a hot tub pillow to allow for deeper relaxation. Hot tubs. Warm, bubbly, and a great form of relaxation, hot tubs are considered a staple of luxury for people around the world. Although associated with spas, hotels, and other commercial venues, more and more private homes are now able to invest the funds needed to install a hot tub in the backyard or even inside. We’ll start this section with a comparison table to get oriented, and then move into looks at individual products. We’ll conclude with our favorites. Product Dimensions: 91 x 42 x 29 in. The QCA Spas Model 0H SM Sirius 2-Person Oval Spa is a comfortable two-person hot tub that comes with a stylish gray interior and an espresso exterior. It’s a pretty comfortable tub for two people, but keep in mind if you have someone who’s approximately 6′ 2″ or so, they’re only going to be able to recline completely if they’re in the tub by themselves. The company delivers the product curbside. The tub is made from Lucite-Xtra Acrylic which is easy to clean and requires little maintenance. The tub includes an airflow control system to manage the movement of the water, and there the tub is ozone ready. No chemicals are included in the package, so you may want to read up on hot tub chemicals and pick up what you need. The hot tub features 16 jets as well as a heater to keep the spa as high as 104 degrees Fahrenheit. The full product weighs roughly 214 lbs without water or people in it, so it’s got some heft! Typically it takes about 24 hours to heat up water from tap temperature to 104′. There is a 12-volt lamp, a 15 ft. GFCI protected cord that connects to a 120 volt/15 amp outlet, and a 1 KW heater. There’s no need for professional installation, just plug and play and go. When you’re done the session, put the cover on the spa, and lock it for safety with the included locking system. You can see QCA’s warranty here. It’s a pretty solid warranty, but be sure to register your spa with them when you purchase. 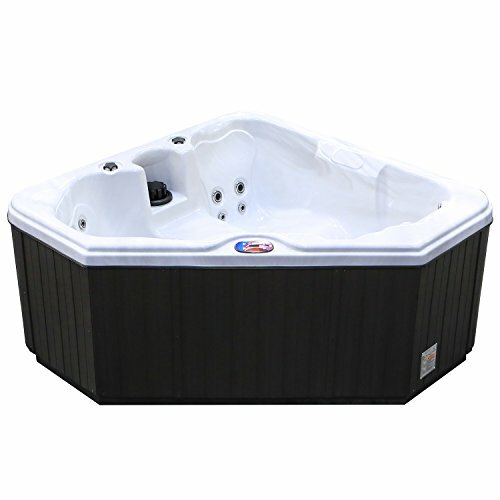 The QCA Spas Model 0H SM Sirius 2-Person Oval Spa is a reasonable hot tub for the price and includes adequate space for two healthy weight people, but not two heavier individuals. The jets are controllable, which is great. The downside, though, is that some customers have experienced major leaks right after the warranty expired, and customer service can be difficult to reach. The interior plumbing and drain area are fairly easily accessed through the included panel, but no one wants to deal with significant leaks. For these reasons, the QCA Spas Model 0H is not as good of an investment as other models on the list like the Essential Hot Tubs or the Hudson Bay. Product Dimensions: 84 x 60 x 35 in. 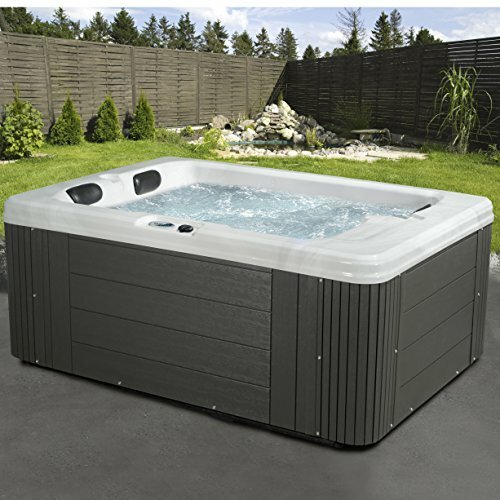 The Essential Hot Tubs Devotion is a mid-priced hot tub that comes in either gray or espresso and features full dimensions of 84 x 60 x 35 in. The tub has a 220-gallon capacity and weighs around 450 lbs — noticeably bigger and more luxurious than most of the other spas on our list. The manufacturer delivers the product curbside and includes an insulated cover with locking clips to help preserve the hot tub. The interior features 24 stainless steel hydrotherapy jets to help people relax and provide a soft, pulsating massage for the muscles. 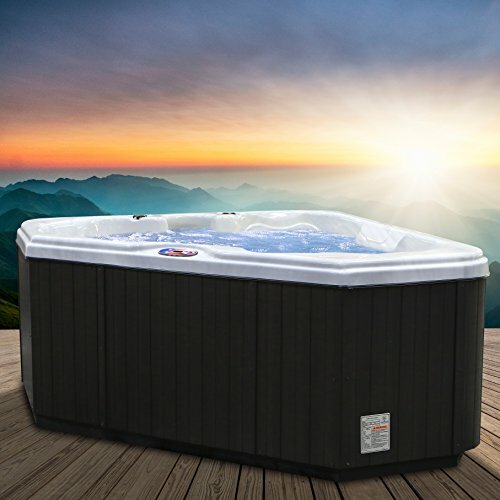 Essential Hot Tubs includes a pretty solid warranty as part of the purchase, and different aspects of the tub are warrantied to different time frames. See this page for their warranty information. 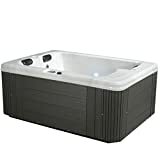 Some other specifications of the Essential Hot Tubs Devotion Tub are that it includes a 1kW/4kW Balboa heater, requires a 110V/15A electrical connection, and features a 1×1.5 HP pump for water movement. No electrical connections are needed with the included GFCI cord, simply plug it in and you’re good to go! The pump possesses two different speeds for maximum comfort and noise issues. A manual with complete installation and maintenance instructions are included to ensure owners know how to take care of their hot tub. No chemicals are included, but what is included is an ozonator! An ozonator will help keep the tub water clean, and will result in the use of fewer chemicals over time. For extra fun, the product has a multicolor programmable underwater LED light for parties, relaxation, and general customization. The Essential Hot Tubs SS244247403 Devotion spa is a fan favorite for a reason. Although a mid-range hot tub, the plumbing and electrical components of the product are solid and the appearance is sleek and pleasing to the eye. The ozonator means that you’ll use fewer chemicals, which translates into a lower running cost over time, and the reasonably large capacity makes this the best 2-person hot tub around! Some users struggle with installation and setup, but it should be straightforward for people with some experience. And you typically only need to do the setup once. 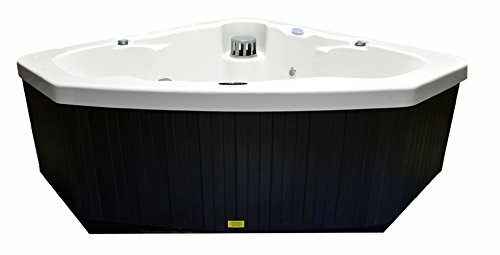 The main drawback to the SS244247403 is the price, but since the cost is reasonable for a mid-grade hot tub, the money is well worth the investment. For its quality, the Essential Hot Tubs Devotion Spa is, therefore, this list’s top pick. 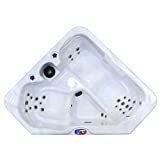 The American Spas AM-628TS 28-Jet Triangle Spa (American Spas AM-628TS) is a mid-range hot tub available in two separate designs: sterling and smoke or Tuscany sun and mahogany. 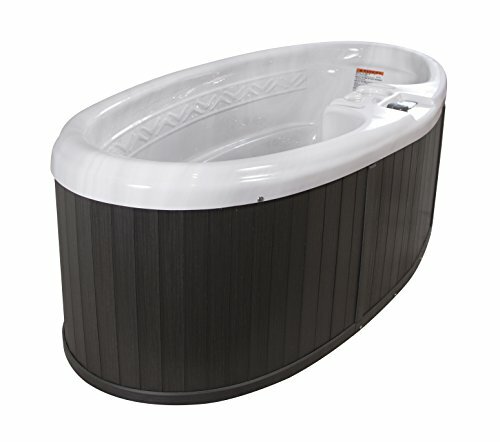 The tub comfortable fits two people and includes 28 stainless steel massage therapy jets for the ultimate relaxation. There are waterfall jets present on this tub for additional cool-factor, which is always a plus! Reusable filters do come with the American Spas AM-628TS, as does a discharge cell for regular hot tub maintenance. A pre-installed system purifies the water with active ozone bubbles as well as a 5.5 kW titanium heater to raise the temperature of the water. The full product dimensions are 72 x 72 x 35 in. and weighs roughly 600 lbs. There is a 110V/240V 2.0 BHP jet pump and a 110V plug and play kit. For typical circumstances, you’ll be able to plug this into a standard 15amp dedicated circuit (commonly found on exterior plugs). A warranty is included as part of the purchase, and like the other tubs on our list, different aspects of the tub are warrantied for different lengths of time. See the technical document here for warranty information. American Spas advertises this one as a 3 person spa, and yes, you could fit three people in there, but (in our opinion) it would probably be pretty tight to have three people in this tub at the same time. 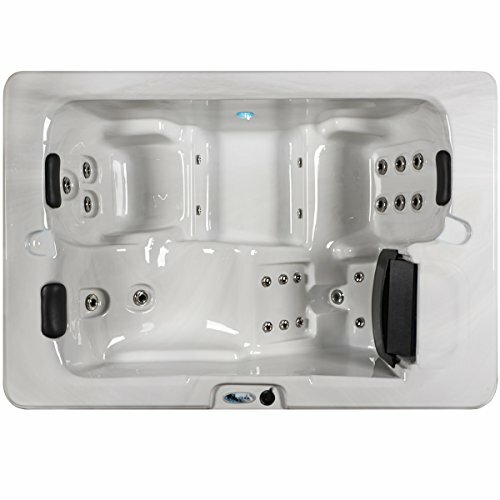 The American Spas AM-628TS is a comfortable and durable hot tub that will seat two people with some room to spare (or three people pretty tightly!). All of the jets are adjustable and there are many of them, which is great for people who tense up or who are looking for relaxation after a workout or stressful day on the job. The hot tub does have some flaws, such as having trouble maintaining a temperature over 100 degrees and relatively thin insulation, but the technology and plumbing are solid. Overall, it’s a decent product for its price. However, there are some more reliable hot tubs for lower prices, and for this reason, the American Spas AM-628TS doesn’t make the top of this list. Product Dimensions: 72 x 72 x 30 in. The Hudson Bay 3 Person 14 Jet Spa with Stainless Jets is a large hot tub designed to seat up to three people that work comfortably with two individuals. The entire tub is made of acrylic material with fiberglass reinforcements as well as anti-slip bottoms. 14 jets embedded in the sides provide relaxation and a water massage. There are waterfall jets on this tub, and some included lighting. Both of these aspects add to the charm of the tub, and make it feel a bit more luxurious than some of the other options on our list. If it was a square tub, the Hudson Bay 3 Person 14 Jet Spa is 72 x 72 x 30 in. Of course, this has a triangular shape, and the angled size is about 62″ long. The hot tub weighs a whopping 540 lbs without water and people, and requires some setup and installation. It comes with a 110V/20 amp and needs a standard 110V outlet to function properly. Just be aware that the cord is placed inside the panel walls when the tub arrives, and must be removed and plugged in. Don’t drive yourself nuts searching for a cord in the box — it’s in the tub housing! An insulating hot tub cover is included to go over the hot tub, and there is also a manual with instructions for safe use. Full pumping and electrical systems are already installed in the hot tub and just need to be set up in the yard. An ozonator can be added to the hot tub, but is not included as part of the package. A warranty is available from the manufacturer to cover damage and typical wear and tear, and the model comes in ivory white with black accents. As with most of the spas on our list, the manufacturer provides different warranty lengths depending on the part of the tub that is covered. See this document for more warranty information. The initial setup can be a bit tricky for people without any plumbing or construction experience, but once built, the hot tub is durable and capable of lasting for a long time. The only flaw some buyers find is that the hot tub can take a little while to heat up fully. Otherwise, the Hudson Bay is a good deal for its price point. For all of these reasons, as well as the low price, the Hudson Bay comes in second place behind the Essential Hot Tubs Devotion. Product Dimensions: 98.2 x 26 x 58.7 in. The SaluSpa Siena AirJet Inflatable Hot Tub is a convenient, easy to use hot tub which can be set up through inflation. 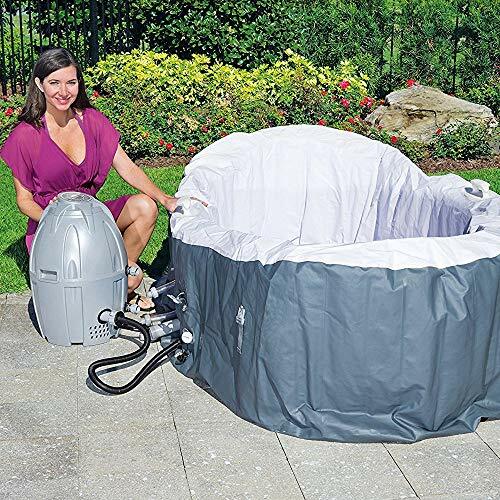 It has special seats to comfortably accommodate two individuals and comes with a waterproof cover to be placed over the hot tub after inflation. Full product dimensions are 98.2 x 26 x 58.7 in., and the tub weighs 78.9 lbs. It’s much lighter than the other spas on our list, but keep in mind that the weight of the water will still be several hundred pounds, plus occupants. If you want to use this on a deck, you’ll still need to consult with a structural engineer or building official to determine that the structure can handle the load. The SaluSpa Siena can be deflated for easy storage. The entire hot tub is simple to set up and is made of tough material to prevent punctures or tears. It is especially convenient for people who like to travel and would like the luxury of a hot tub on the road. It can be deflated and packed away for storage without too much difficulty and can be reinflated quickly. Just remember, each time you pack it away and unpack it, you’ll need to reheat the water, and adjust the chemical levels. The SaluSpa Siena AirJet Inflatable Hot Tub is white on the inside and gray on the outside. The jets are arranged into an adjustable massage system, and the entire hot tub can reach 104 degrees Fahrenheit. One nice feature of the Siena is the included white plastic table that can be placed across the hot tub for convenience. There’s no need to pick up a hot tub side table. A warranty is included with purchase, and you can view the warranty specs here. The warranty generally isn’t as good as the other units on our list, but it’s still pretty decent. The SaluSpa Siena is a pretty sweet inflatable hot tub that’s ideally shaped for two people and includes a nice jet system and a cool included table. 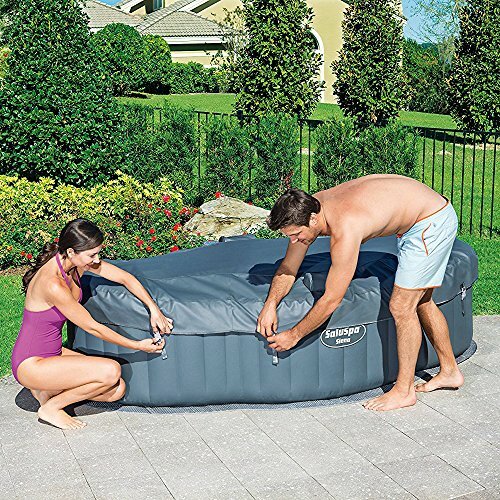 It’s priced pretty competitively as a two-person hot tub, though we should mention that there are many other cheap inflatable hot tubs that are larger, and are lower priced if the price is of primary concern. The SaluSpa Siena is a nice budget choice, though if you decide you want to go the inflatable route due to price concerns only, you may want to consider some other larger inflatable spas that may offer a better bang for the buck. Many are looking for a small-scale hot tub that’s perfect for just a couple of people, that doesn’t take up too much space, but provides the lovely, lively bubbles and heat of all the best hot tubs. Out of all of the options currently available, buyer’s can’t go wrong with an investment in the Essential Hot Tubs SS244247403 for quality. It’s very well built, stylish, comfortable, and has a great warranty. A less expensive, but still good, option is the Hudson Bay 2-3 Person 14 Jet Spa. The triangle shape may be more convenient for some buyers, and the whole system is quite nice. 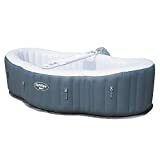 For those on a budget, look at the SaluSpa Siena Inflatable Two-Person tub for a great tub at a bargain price. Don’t let sitting in hot, bubbly water be reserved for the wealthy, or those being boiled in a stew. Invest in a hot tub today and get relaxation from the comfort of the backyard!